Hello blogging friends. Posting late today. Spent the best part of the day decorating for Fall and Halloween and Fall cleaning. Time flies when your busy and the day just got away from me. I made this Wedding card for my great niece, my sister's Granddaughter. She and her new husband, had a private wedding a few weeks ago, and they are hosting a reception at their home on Saturday. Congratulations to Kristen and Nelson on their marriage. 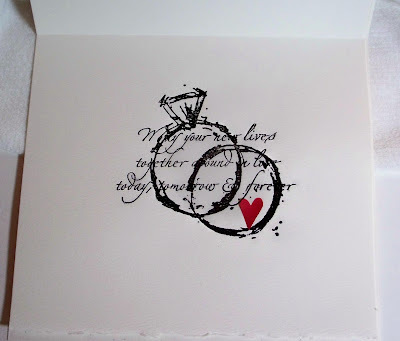 I started with an ivory speckled card stock. The die is Lacy Oval, Spellbinders. are Prima. Small white flowers are a punch. Pearl centers, Kaiser. I used some old stamps here, the sentiment on the front is PSX. Art Impressions. Small red heart a punch. 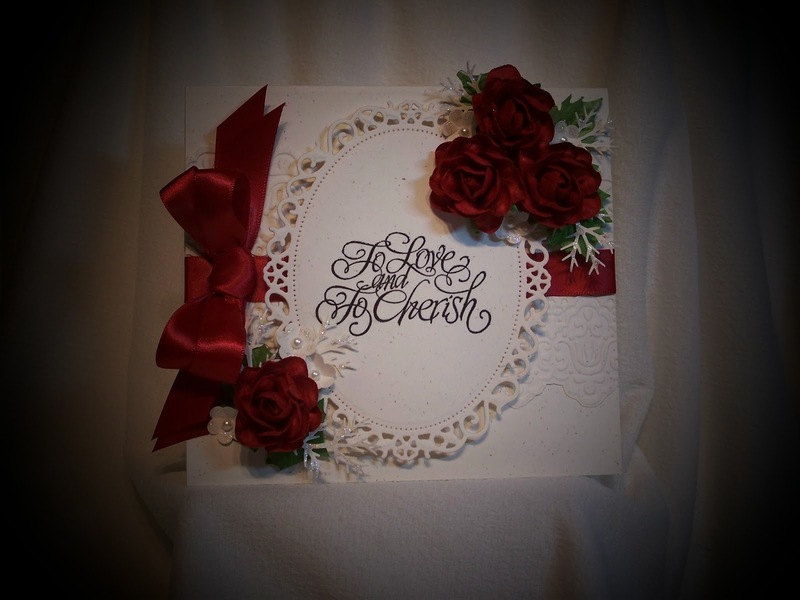 Gorgeous wedding card Sue, love the rich red colour with the white, so elegant looking! Fabulous work on the inside too! such an elegant composition Sue! I hope you are well! Have a good time ! This is gorgeous!!!! I love the outside with all the pretty flowers and die cutz, but the inside is my fav! What a great way to combine images and make something really special. Impressive!!!! I like the picture at the top of your blog too - sweet! Hugz! WOW spectacular card. I'm sure it will be the prettiest one they get. The red roses and that beautiful ribbon really bring new meaning to the word "pop". Have a good day. How is our student? 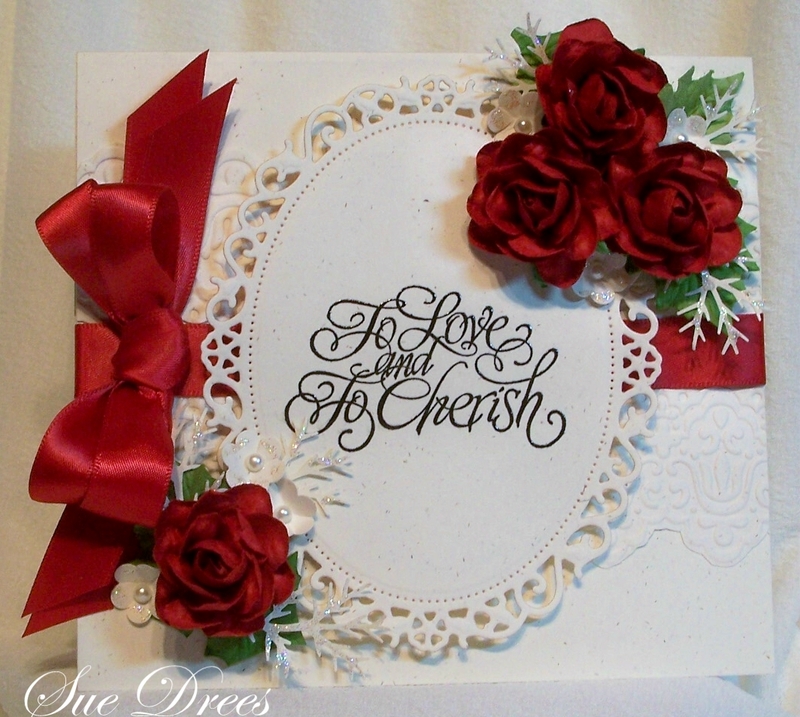 This is so beautiful Sue.I love the red and white. GORGEOUS yes am shouting so classy & elegant love it. Sue you just present a gorgeous wedding creation cards . I am really amazed by your designs. Love the red roses and elegant design!